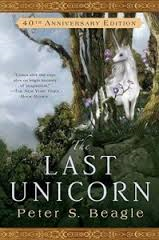 The Last Unicorn is one of those books I'd heard so much about and has often been hailed as a classic. Many of my writing heroes, including Patrick Rothfuss, have declared it a masterpiece. He even said it was one of his favourite books, he's probably my favourite writer, so I had to see what it was about. I wasn't sure if it could live up to my expectations. When you read this book you feel like you are in a dream, its beautifully poetic and resonant. It's easy to see that this mighty classic, originally published in 1968, has inspired authors such as Neil Gaiman. The imagery is luxurious and bewitching. Each sentence is a treasure to read, this book is like a fine wine it should be enjoyed sip by precious sip. This book takes us on a journey but not your typical cliché journey you so often find in fantasy fiction. It's a delightful children's tale that is intelligent and charming much the amazing 'His Dark Materials' by Phillip Pullman. A unicorn all alone in a lilac wood overhears that there are no more unicorns. She refuses to accept this and sets out to find her kin. On her journey she is accompanied by a hapless wizard, embarking on his own quest to discover the true nature of magic. The book is full of interesting and diverse characters. Along the way they meet many lively characters: dark witches, sinister harpies and confused butterflies. Despite this book being set in a wonderful magical kingdom this book perfectly mirrors life in the real world. This tale is funny, sad, enraging and above all poignant. This is a story of unflinching hope and refusing to give up even when you look like an idiot. My only regret is not reading this book when I was a child. It's the closest way to be transported into the land of fairies.